Known for its majestic castles, mighty fortresses, and ornate churches, the Czech Republic is an ideal place to discover art and architecture. During this two week Global Prep Program, you’ll get an overview of Czech history and culture by examining topics like Art Nouveau and Cubism. As you tour the medieval capital of Prague and wander through small towns in the countryside, you’ll experience the distinct culture and style of each area you visit. 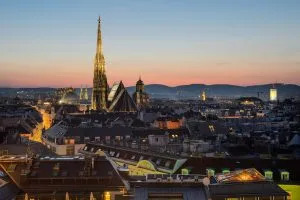 You and your group will also have the chance to explore the elegant charm of Vienna, capital of the neighboring country of Austria. Age 15years 0month(s) to 18years 11month(s) Language Medium English will ensure you can enjoy the program and are able to interact with the other multinational participants. xplore the art and architecture of the Czech Republic up-close as you visit castles, towers, and town squares. You’ll begin with a tour of Prague, where you’ll trace the city’s origins along the Vltava River. Then you’ll venture into the Bohemia region to explore medieval towns like Český Krumlov, which is known for its astounding 13th century hilltop chateau. Next you and your group will head to Vienna to get a taste of Austrian food and culture. There you’ll have the chance to explore sites like the Schonbrunn Palace, with its stunning grounds and extensive art collection. As you visit the small towns and bustling cities of the Czech Republic, you’ll have plenty of time to hang out with your friends and go souvenir shopping. Maybe you’ll spend an afternoon taking pictures of the historic homes and monuments you pass and then pick up some knick-knacks from quaint little shops. You’ll also get to appreciate the country’s natural beauty by visiting the Prague botanical garden and going on scenic hikes in the countryside. As your time in the Czech Republic comes to an end, you’ll wrap up your cultural adventure in style with a boat tour of the Vltava River. During your two weeks in the Czech Republic, you’ll stay at local youth hostels with other members of your group. You’ll visit Czech markets and restaurants for many of your meals, which will likely consist of pork, beef, and delicious sauces. You might also have the chance to try some street food like sausages or fried cheese. To satisfy your sweet tooth, try the fresh fruit dumplings called ovocné knedlíky.